I grew up in a small farming town. In my town, if you didn't work in the fields, you worked in the factories at the edge of town or in the surrounding towns. It was all very John Cougar Mellencamp. One of the factories in my town was owned by the family of my aunt's husband, and my father and many other family members worked there. My siblings and cousins all worked there in the summers doing little tasks. One of my fondest memories was my Dad would let us roller-blade on the empty factory floor on the weekends when he went down there to check on stuff. 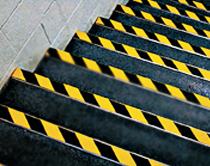 Thinking back on it, that was kind of dangerous, flying at high speeds in a dark factory, with just enough light on to get around and see the yellow paint on the floor. So I was surrounded by machinery, metal slag, and safety paint for my entire youth. This newest Field Notes edition, the Utility, speaks to me in ways I didn't expect they would. With Utility, the Big Idea is "Getting the Job Done". To help you achieve that, they offer two different rulings: Ledger and Engineer Graph. Subscribers get one 3-pack of each; you have a choice of which one to buy when you purchase individually. On the Utility product page, Field Notes says these are two of their most often requested rulings, but you wouldn't know that if you hung out in the Field Nuts Facebook group...these ruling choices have been panned by the majority of the comments I've seen. That means little, however, since people are most vocal about what they don't like, opposed to what they do like. These are the standard Field Notes pocket notebook size: 3½" x 5½". The cover is made from 80# cover stock from Mohawk called Via vellum. They use the Safety Yellow color, which to my eye reads a bit more orange than yellow. It's very similar to the yellow of Caterpillar Inc., a company that was one of those factories people from my town went to work for and a big customer of the family business, before it, like many, shut down due to globalization. The text and logo on the front and back cover are, inside and out, printed in black with some red accents, and the ruling that is inside the book is printed on the bottom black stripe of each book. With the black belly band, the design reminds me of the black and yellow safety stripe on the edges of stairs in factories. But the most interesting part is the fold-out ruler in the back. Field Notes always has a 5 inch ruler in the back flap of their books, but this time around it is folded inside when closed. One side has inches and the other has centimeters. Here's the kicker: because this is folded in and the printing and cutting process what it is, they had to indent the back cover's long edge in 1/8". So essentially, the back cover is not as wide as the paper. This strikes me as a little odd and not quite what I expected. They mention it in their copy on the product page, but they don't have any pictures of it, as all pictures of the back cover feature the ruler somewhat in use, so unless you read the entirety of their website marketing copy, you won't know this is the case. It surprised me in my unboxing video. The inside paper is 70# text, Mohawk Via vellum as well, this time in Pure White. The paper is ruled in Ledger and Engineer Graph, as I mentioned above, and is printed in a very fine, very light gray. This paper is heavy and very toothy. You can literally see the texture when looking at it with the naked eye. It is perfect for pencil, with just enough tooth and just enough smoothness. You'll want to use an HB, however, as some of the softer pencils I've used don't have that great of point durability on this paper. Because this paper does take a lot of graphite, ghosting onto the other page will definitely happen, again, worse with the softer grades. Pen seems to work just fine, rollerball and gel ink. Ball point is a little "meh" but aren't most ballpoints a little "meh" to begin with? Fountain pens, on the other hand, seem to do just OK with finer nibs, some medium nibs, but for wet medium nibs and thicker, feathering/spreading and bleed through will definitely occur. Also, the tooth may be a little too much for someone who wants a smoother writing experience. I found my Pilot Metropolitan with a Fine nib wanting to catch from time to time. Fans of Field Notes and Fountain Pens have long been wanting an edition that they can use with all of their favorite pens and inks, and while this is a step in the right direction, this also wasn't the theme for it. You can't make a Tonka TuffBook and then have some of the finest paper...the grit and tooth of this paper matches the theme of the books. My favorite pencil in this book was the Blackwing 24 / 530 and my favorite pen was the Pilot Precise V7 Fine. For fountain pen, my Pilot Metropolitan with an M Nib and Pilot Namiki Black ink was a winner. The F nib was too fine and kept getting caught. The Lamy F too fine as well, but the M laid too much ink that feathered. Pilot M nib was the sweet spot. Disclaimer: remember that I'm the cheap FP guy...I don't have anything super nice or expensive...your mileage may vary. This will get a lot of use. The Subscriber Extra that comes along with the package is pretty nice. 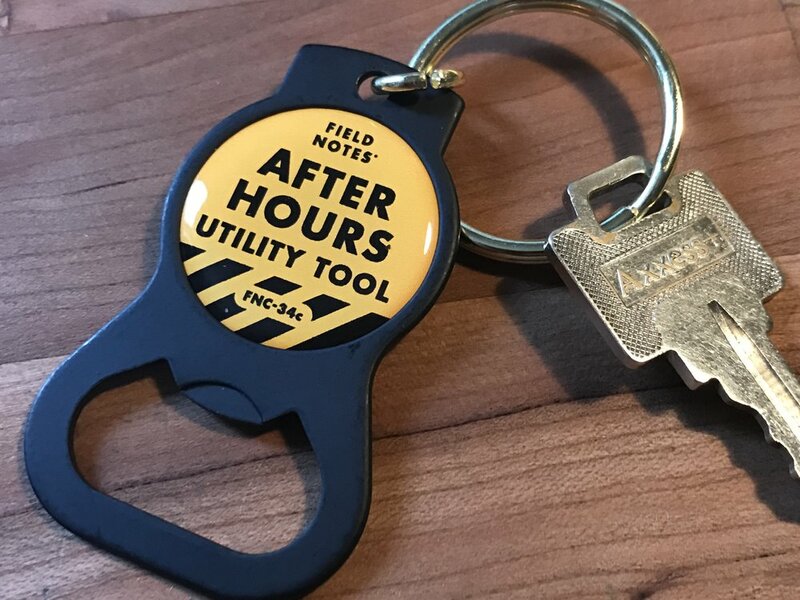 It's a bottle opener keychain called the "After Hours Utility Tool". As someone who, until recently, worked in the beer sales industry, I have seen more than my fair share of promotional keychain bottle openers. This one is quality, folks. I am definitely making use of this thing. Let's talk for a minute about pricing and quality. I'm going to preface this by saying I am well aware this is a 1% of the First World Problem type of thing, and it really should have no bearing on someone's overall happiness. This has kind of been a hot button topic recently in a few stationery groups on Facebook, however. Ultimately, it comes down to this: Since Byline, Field Notes have raised their price on the Limited Editions that are released quarterly. What was once $9.95 is now $12.95, a $3 increase. Of course, this makes subscribing that much more of a good deal. But what I think has happened, Byline was a wildly different product for them, and a completely different form factor, so no one sneezed at $12.95. Then Lunacy came out, and the books were cool and die-cut, so hey, yeah-maybe, ok $12.95 is alright. Then Black Ice. Some loved, some didn't, but playing with different binding and a weird foil situation...yeah, ok $12.95. All the while, they were releasing brand collaborations with Nixon ($15), Carhartt ($13.95), and LL Bean ($13.95), all with higher prices than even the newly priced Limited Editions. But the Nuts ate it up, bought it out, and seemed ok with a higher price point. However, this whole time, there has not really been a peep from Field Notes about these price hikes, or if there has, I haven't been able to find it. And yes, I know...you have the option not to buy anything you don't want...I get it. You have the option not to subscribe. Even though, don't the Nuts, who usually buy in large quantities, deserve an explanation or a reason? Even if you can justify to yourself that it's ok and what used to buy me 4 packs will now only buy me 3, can't there be expectations of quality? This circles me back to this release, Utility: an overwhelming amount of people in these groups have had issues with the corners of their books being blown out and torn at the spine, as well as really poorly cut rounded corners. I watch these groups like a hawk when the new stationery items get released, just to see the pulse of the fans. This time there is way more complaining than ever before, and even from people who are usually what I would call "FN Apologists". When they're complaining, it seems like something is awry. The Utility isn't the first set of books to have these problems: the LL Bean that were released in January and the Carhartts that were released in November have similar issues. But since these were retailer-only releases, not as many people got them in their hands at one time as the quarterly subscriber editions do. As for my books, they are very poorly cut. I have spine blowout on each book in both packs. But the rounded-corner cutting is the worst of it all. As you can see in the picture, these look like they've been cut all kind of sideways. This is verging on unacceptable to me, and with the recent price increases, it leaves an even more sour taste in my mouth. Do I hate Field Notes now? No. Am I "out for blood"? No. But I do believe that this should have been caught and they should have held off on releasing these until they fixed the problem. Field Notes is just a brand with a design team and a shipping department. They don't actually make these books, just as Baron Fig or Moleskine don't make theirs. So their printer should be on the hook for these issues. These books feel tight: they feel like the thicker paper that was chosen has been packed into the same size wrapper (the cover) and that wrapper is busting at the seams. Where the Shenandoah and the Workshop Companion (both similarly spec'd books) feel solid, the Utility feels fragile. I feel like if I fold it back onto itself, the cover is going to rip from the staples. Maybe this is a symptom of this type of paper; Mohawk bills Via as their "economy" option. Is this a one-time thing or a symptom of something bigger? Are the larger print runs and more experimentation with paper and binding styles hurting quality? Or is it that the need to come up with something innovative that will wow their customer base every 3 months finally taking its toll? Only Field Notes knows the answer to that, and I hope that at some point they will communicate it to their customers. "But Mike, they don't owe you anything." True, however, many people are deeply invested in this brand, more than most other stationery brands. I'll be interested to see how this is handled in the coming weeks. I'm convinced it will be cordial, professional, and thoughtful. I'll finish by saying this: Utility is awesome. I love the theme, I love old manufacturing / construction style. I dig that they are playing with paper weight and using different ruling than usual. The subscriber extra is killer this time around. But if the flip-out ruler was gonna mess up the printing process, I could have gone without it.